Thanks to the Engineering Inspiration Award we received at the FIRST North Carolina Regional, our adventure continued with the 2014 FIRST Championship. It was again an unbelievable experience with so many FIRST Robotics Competition teams and all those enthusiastic and kind people. It was a lot of fun to see all those reactions about our crazy outfits and our pit design. We went exploring through the town and visit several monuments and buildings. We went to a baseball game at the Busch Stadium, visit the Gateway Arch, Jefferson National Expansion Memorial, were you get a beautiful view on Saint Louis. During the championship we met some FIRST teams from the Netherlands. It was great to see all the 4 FIRST competitions gathered in one place. 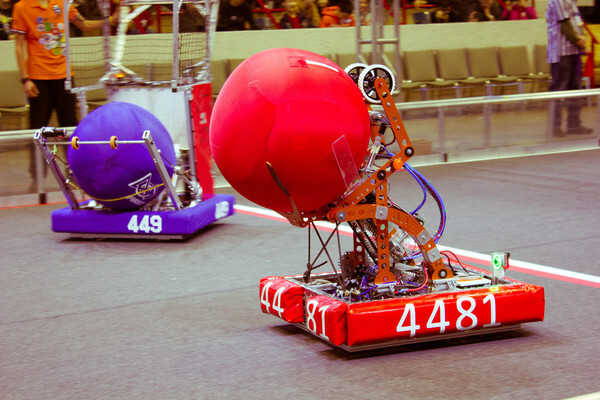 We were assigned in to the Newton Division, 1 of the 4 FRC divisions, together with 100 other FRC teams. We were very proud at our performance during the 2014 FIRST Championship. We managed to finish at ranking 84 out of the 100 teams in our division. But we were honored with the Imagery Award in honor of Jack Kamen. It has been another wonderful and great FIRST Robotics Competition season. Check out our wonderful pictures and videos.